As I get older, I'm really getting it through my head that some of the best restaurants seem to hide in strip malls. Everything from nice, "glammy" looking strip malls to dumpy, worn-out looking strip malls. Guy Fieri has demonstrated time and time again that some of America's best, most original and most popular food is being served up in the most non-glamorous settings. And, once again, I have proven this to myself. 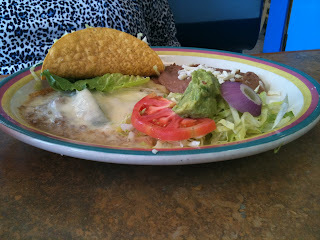 A few days ago, my mom and I set out with a friend to have Mexican for lunch. We drove up to the restaurant we had decided on, only to be greeted by an empty parking lot and a handwritten note on the door..."Closed every Monday." Well, I guess every Monday is better than random Mondays. Having control of the car is certainly an advantage. As my companions began discussing some meat and three type set-up, my taste buds and my brain were already on the way to the border. I turned left, just knowing that a Mexican eatery had to be in my path. That's when I saw it. It is a small sign in a strip mall marquis that I've seen before. I haven't ever heard anyone utter a word about this place and have made mental notes when passing by that I need to check it out sometime. That sometime had come. 7 Mares is a refreshing change. They offer all the usuals, but there is TONS of seafood on the menu as well. The waitress started us off with a different type of chips & salsa scenario. These chips were homemade but with flour tortillas rather than corn. And,the salsa was a tomato base but was sweet. I'll elaborate on that in a minute. I ordered the shrimp relleno, mom had a combo with chili relleno, taco and guac salad and our friend Cookie had grilled steak & peppers, rice, beans and hot, fresh tortillas. Her steak was awesome...you could really taste the grill, which reminded me of one of my favorite Mexico experiences. My parents and my sister and I went to Cancun for a long weekend after K finished Colorado State. When we arrived at the hotel, we checked in and then headed out toward the beach to check things out. Right on the sand was an elevated thatched deck with two ladies making homemade tortillas and filling them with beef right from the grill. It was simple and off the charts! Mom's was pretty typical, but certainly good tasting. I tried her guacamole and it was quite nice, although I think my new favorite guac recipe is the best on the planet. 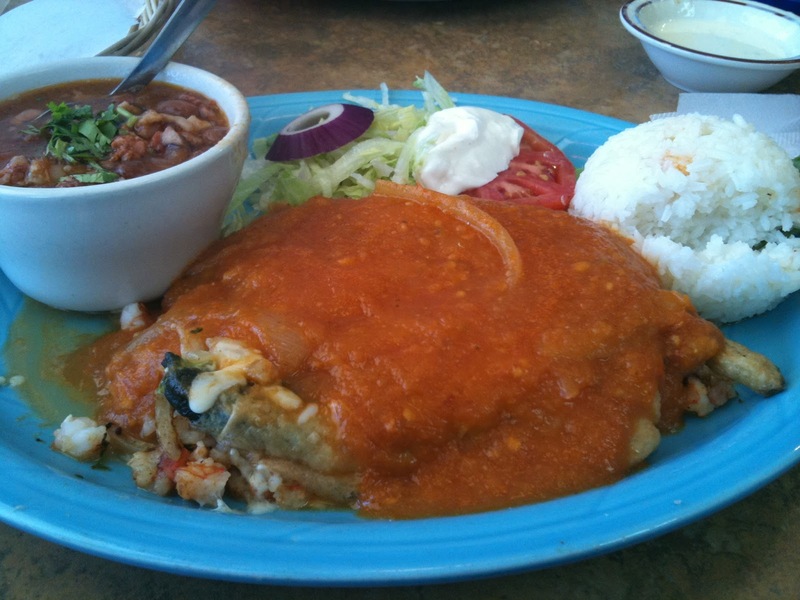 Now mine was the star...it was a ginormous Poblano pepper stuffed (and I mean STUFFED) with shrimp and queso and then covered with a tomato sauce so fresh and light that it was surprising. My dish also came with a side bowl of "ranchero" beans that were also super flavorful, thanks to lots of bits of bacon in the sauce. This relleno was so large, I could only handle half and brought the rest home for the Neilio to try. As we were eating, a male manager came to our table to ask how we liked our lunch. Always a nice touch, especially if you're really actually enjoying your food instead of just having to say the obligatory "fine." Later, as we were finishing up, a female manager approached us to also check on us. We began talking and she confirmed that the sauce on my dish was freshly made & went on to say that they make everything fresh each day. She elaborated that their "sweet" salsa is designed to compliment their seafood emphasis, but they have spicy salsa available as well. She also mentioned that the cool drink in the pineapple that we saw go by was their homemade pina colada...uhhh, hello Happy Hour! 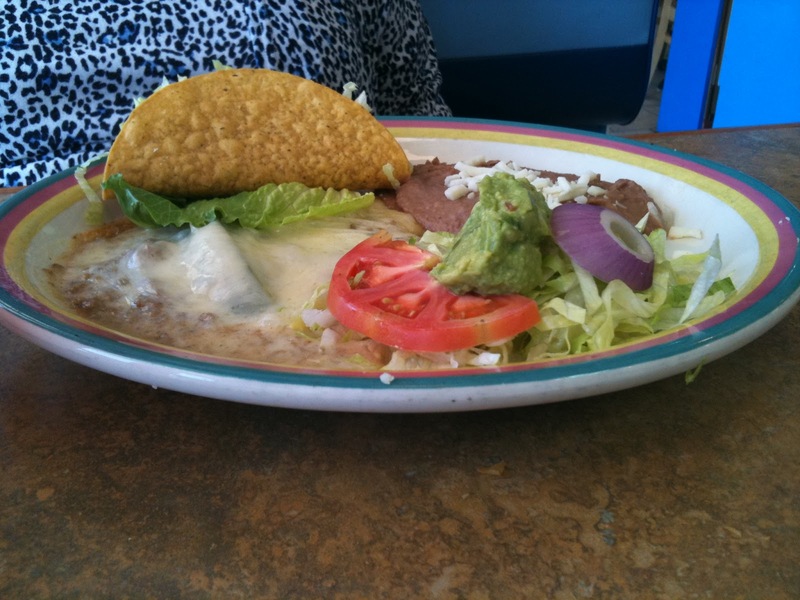 We talked more about how it's so hard to find Mexican seafood meals and that we'd happily return to this restaurant. Now, here's the funny part of this story. I came home that evening and told Neil about this place and how I want to go back with him so he can try it out. A little while later, he disappeared for a bit (he always goes outside to use the phone because the cellular signal in our house is schizophrenic). So, he comes back and announces that he had just talked to our friend "Jeff-ro" who lives near this place and "Jeff says this place is the bomb." You can probably guess what my response was..."what? you didn't believe me? You had to get a second opinion?" 7 Mares is a nice, refreshing change for anyone who enjoys Mexican food. It's in a strip mall, like lots of good places, but ya know, the decor is also kinda strip mall-y. But that's ok. The food makes up for it. And, oh by the way, on this lunch outing, we were the only NON-Hispanic people in the joint. ALWAYS a good sign! Well, last week, I noticed that this new product that I'd never heard of was on sale at Publix. It's Progresso's "Recipe Starters." Now at first, I thought this was like those new concentrated stocks that a lot of the broth people have introduced. I downloaded some coupons and decided to check this stuff out. Turns out they're not all stocks. They are bases to start recipes with and the can actually has a recipe on it, in addition to the URL of more recipes and ideas. I selected a variety to give it a try: Creamy Parmesan Basil, Fire Roasted Tomato, Creamy Roasted Garlic and Creamy Three Cheese. Just a couple of days later, I received an email from MyBlogSpark to introduce me to "Progresso Recipe Starters" and it included a link to a high value coupon for it. They have encouraged me to post this coupon link for you, my faithful reader, to download and give the product a try. I decided to use one of them myself so I could give you my two-cents' worth, in case you're interested. I used the "Easy Weeknight Bacon Mac n Cheese" recipe right on the label. You can view the recipe right here. I served it with a grilled flatiron steak and green beans. This dish was very tasty (BACON!) and very creamy. I think the flavor could be boosted even more with a sharper cheese thrown in, like blue cheese maybe. And, it was a snap to prepare. It absolutely fits the bill for an easy weeknight dish. If you are the type who prefers the old school, drier oven baked macaroni from your grandmother, this may not do it for you. 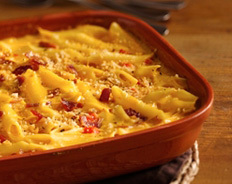 But, if you are one who digs hot, cheesy, creamy pasta...this is a winner. If you're interested in trying out this product, the nice people at Progresso have made this coupon available to us. And, their generosity doesn't end there. They also included a coupon for Progresso Light Soups. These are low calorie soups; some as low as 100 calories! Please note that this information and the coupons were provided to me from MyBlogSpark and Progresso. Download the coupons and try out the products. Thank you Progresso! 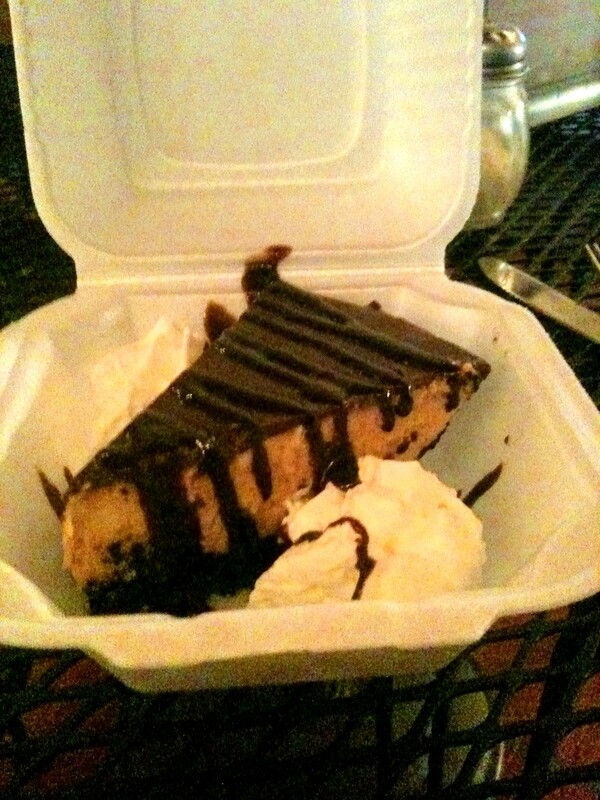 As Southern as I am, there are some typically Southern foods that I simply did not grow up eating. For example, collard greens and stewed tomatoes never, ever, ever made an appearance in our house. And neither did fried green tomatoes. The collards and stewed tomatoes were banished because my mom hated them, therefore, she wasn't going to cook them. Makes sense if you think about it. But the green tomatoes? I don't remember any talk about either she or my dad being opposed to fried greens. In fact, growing up I never heard anybody talk about this dish. I never even heard of it until the movie came out. So, anyway, what does this have to do with my title? I think that perhaps I was somehow destined to become an addicted lover of the fried green tomato. When I was about 3 or 4, my dad planted a little garden in the backyard. He had a bumper crop of tomatoes in the making. He was quite proud of this stand of plants and excited about all the fruit it was producing. Interestingly, my dad doesn't like tomatoes. Oh, he'll eat cooked stuff like spaghetti, vegetable soup, pizza, etc. but raw tomatoes are not his deal. At All. However, like all good Southerners, he planted them and has done so every year of my entire life. Now picture this: toddler/pre-schooler out in the backyard playing, frolicking and generally being a cute little bundle of joy. Now picture this: tall, leafy plants brimming with green balls. I ask you, what little kid doesn't love balls? You see where this is going I bet. So, after a little work, I toddled up the back stairs to very excitedly summon mom and dad to come see. "Come quick, come see!" I took them out to the garden and beaming with pride showed them my enormous stack of green balls. 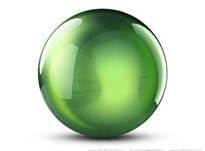 "Green balls!!" I exclaimed. I don't remember exactly, but I think my dad may have shed a tear. Not sure because I believe my mom quickly ushered me inside to shelter me from any possible tomato-related wrath. Fast forward to now. I love fried green tomatoes. I make them at home. I order them in restaurants. I've even had them at Paula Deen's place in Savannah. (Yes, I admit I've been there. But, I assure you...my accent is real and unexaggerated!) For the longest time, the only way to get green tomatoes was to grow your own and pick them at the "green ball" stage. However, they have started showing up in grocery stores and last week, I found a plethera of them at the farmer's market. Happy, happy, joy, joy. We bought about four of them and fried those babies up! Even though I caused my dad some heartache all those years ago, I think that whole experience was just foreshadowing of my green tomato infatuation. Who doesn't like a good, warm muffin in the morning? 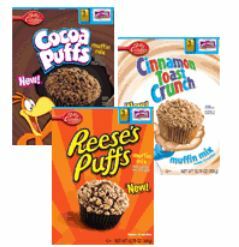 My friends at Betty Crocker and My Blog Spark sent me this valuable coupon for a new line of cereal flavored muffin mixes...Cinnamon Toast Crunch, Cocoa Puffs and Reeses Puffs. They also included a coupon for me to share with all of you, so click here for $.80 off one of these cool new mixes! When you travel, you almost always have to eat out. Thankfully, most hotels now throw in breakfast, which is most humane, quite frankly. Sending people out into an unfamiliar town first thing in the morning, looking for food...just not nice if you ask me. But, then, there are the other meals. Once upon a time, if you didn't know someone from there or who had been there and could make a recommendation, it was quite literally a roll of the dice. It's somewhat easier today thanks to apps and websites such as Urbanspoon to reduce the risk of making a bad bet. 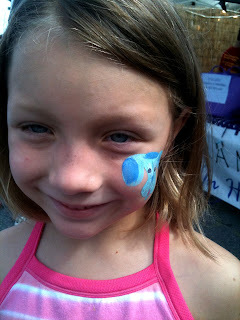 This past Friday, we took the Vivver out of school early and headed up to the mountains. Our final destination was my sister's house for my brother-in-law's Big 4-0. But, first, we stopped off in Hendersonville, NC to check out the Apple Festival, spend the night and then head on up the mountain in the morning. The festival opened on Friday afternoon, so we checked in at the hotel and then headed to Main Street. We walked back down the street to arrive at 2 Guys Pizza & Ribs. We scored! This place is family owned and family friendly. They are located in what appears to be an old warehouse, so the ceilings are high. The bar is large and features seating, but out in the main part of the restaurant, it's set up with outdoor tables, umbrellas, white lights strung from pergolas...you know, creating that outdoor feeling. The Vivver was immediately delighted to find that they have a kids' gameroom. Neil started off with a Two Hearted ale while I stuck with my old stand by...the house Chardonnay. As Neil and Viv disappeared into the gameroom, I was given complete control of perusing the menu and deciding for us all. Y'all are probably get tired of hearing me go off about pizza (yes, I believe it's the world's perfect food. yes, I would order it as my last meal if I were on death row, etc, etc, you guys know me.) The first thing I noticed was how incredibly good this entire place smelled. In fact, I went so far as to post on Facebook how great it smelled and within minutes, one of my friends replied that she had been there and the pizza was great. 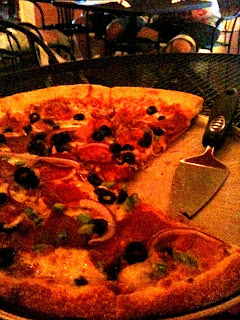 When the pizza arrived, the first thing we both took note of was how visually appealing it was. As we tasted it, we both remarked about how much we liked the addition of the salami, which I don't remember having on pizza before, nor have I thought of it. Delicious pizza topping. As most of you know, a pizza is only as good as its crust. For those of you in Columbia, let me compare this crust to Zorba's. It's substantial enough on the bottom to support the toppings and cheese without being too thick or bready. The outer crust is crisp, but airy and light on the inside. Well, 2 Guys have very similar crust. Just perfect. Neil and I thoroughly enjoyed our pie. And the Vivver? Well, her kids pizza was devoured handily. Took this back to the hotel for later! Now, let me touch on a topic that is important to me. 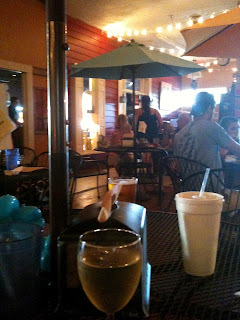 As we waited for our food, I noticed an attractive lady in a white blouse who was on the floor, expediting at the window, greeting people as they arrived (mostly all by name) and seemed to really be on top of everything going on in the restaurant. Clearly, the owner or manager. I asked our server Mandy and learned that this was the owner, Melody. We ended up getting to talk to Melody ourselves and telling her how much we enjoyed our dinner. She was a most gracious hostess and also let us know that she and her husband both worked the business together, as well as their 3 kids. We chatted a bit, she insisted on buying us a glass of wine (ok, twist my arm) and by the time we left, she gave me a hug! This is what I consider the most fun and memorable type of restaurant experience. When you get great food, have a pleasant experience and leave feeling like you're a regular, they are doing something, many things, right. By the way, Mandy was one of the best waitresses we've had in a long, long time. If you check out Urbanspoon, you'll see that many Hendersonvillites are complaining about this place being cash only...no plastic. Clearly there's a reason for this. I don't know what it is, but there must be a reason. Some merchants simply can't bear to pay fees to process their own money. I get it. So, they have an atm in their vestibule for convenience. Neil used it and was half expecting it to charge an unusual fee for use, but it was merely a buck, like any other atm that isn't your own. Relax people...Get some cash and come have a great pizza. 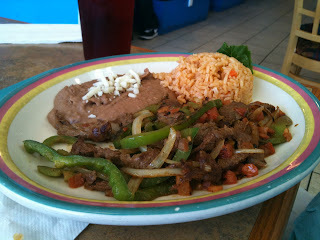 Our experience at 2 Guys was great and we'll definitely be back when we're in the area. It's in the heart of Hendersonville, which still isn't far from I-26, so if you're passing through there, you can head into town to eat and not totally derail your travel time. If you make it there, try to see if Melody is in the house. She's a delightful lady, a fantastic host and the most hospitable restaurant owner you'll meet.